Caltech, a division of Carrs Agriculture Ltd, based in Cumbria, was formed in 1993 following the commissioning of the new feed block plant at Silloth. 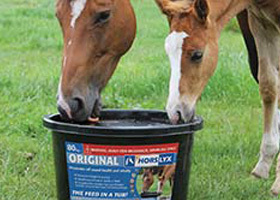 This innovative company is the manufacturer and supplier of Crystalyx® and Horslyx® products – a unique range of cooked molasses-based high energy feed licks for all types of cattle, sheep, goats, deer and horses. All products have been developed following extensive independent university research, to confirm their effectiveness in improving animal health and performance on-farm. Crystalyx® feed blocks are sold throughout the UK and Europe and more recently in New Zealand and South America to become market leaders in their field. Caltech has six sister factories, one in Germany and five in the USA, producing similar research-proven products for the Eastern European and US markets respectively.